Gallery of my oil paintings. Here you can see my works in the technology oil on canvas. 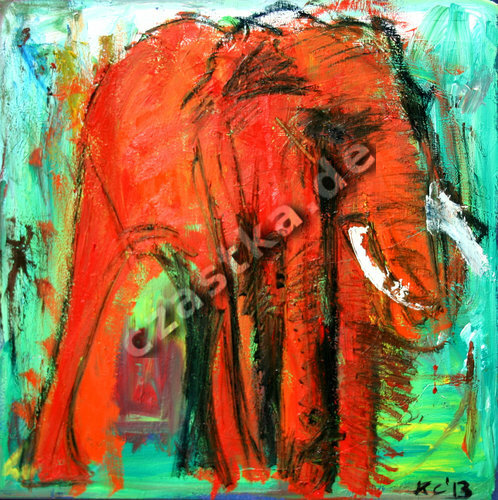 Gallery of the last paintings of my red elephants. Likewise, I am presenting a few examples of the reproductions that I term to as Repro Nale. Gallery of my other paintings.Here you can see my works in another color-media on canvas or paper. Gallery of my drawings. Here you can see my works in the various drawing techniques on paper. Gallery of my photographies.Here you can see my works of analog and digital photography. Gallery of my designs.Here you can see my works and designs on different subjects. Gallery my graphics.Here you can see my works of print graphics on paper. Gallery of my digital media works.Here you can see my works in the different digital media techniques. Gallery my mixed-media works.Here you can see my works in the different mixed media techniques. Gallery of my sketches of contemplationsof what is happening. Here you can see my comment on different subjects. Gallery my workrooms.Here you can see some impressions from my workrooms. Presentation of the documentation of the exhibition in Dortmund Bretz Store in 2013. Here you can see my latest works in dialogue with the exhibition of the Cult Bretz sofas and armchairs.